"It could have got a lot worse than what I've got on my face right now." Watford striker Andre Gray lives with the permanent scar from the time he was stabbed on a night out in December 2011 - a constant reminder of the world of knife and gang crime which marred his youth in Wolverhampton. 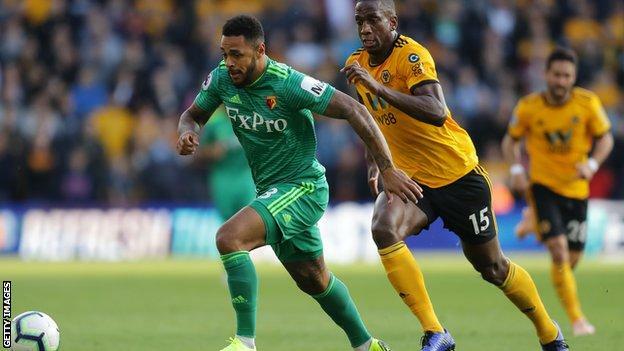 The 27-year-old told BBC Sport he "got lucky" to escape that world, and it was a "long process" - starting when he left home to join Luton in March 2012 - to get out of trouble. "It was gang trouble. It was more a fashion thing at our age. We were from one area, and with people from another area, - it all escalated from there and turned into a big thing. "There was a thing in [local newspaper] the Express & Star a couple of years ago about my friend who went to jail on the front page and it seemed to be all about me and tried to make me look like the bad guy. "How come nobody looks at it from the positive side that it's not me getting involved in that? I've moved away from it and made something positive out of it. "I don't think a lot of people understand the situations I've been involved in and the way I grew up. I took myself away from it and made something out of a bad situation. "I've learned from my mistakes and wrongdoings." "When you come home you're the loving son and when you go out you're a completely different person." Gray was born and raised in Wolverhampton by his single mother. His grandfather - who he was close to - died when Gray was 13. "It's difficult for my mum because she doesn't know half of the things that happened," he said. "She might think the sun shines out of me. That's the case with a lot of parents and their children - they don't really know what goes on when they leave the house. Gray was released by Wolves at about the time of his grandfather's death and spent six years at Shrewsbury - where he made his professional debut. "It was later on in my scholarship at Shrewsbury where it went wrong," he said. "Going away to Shrewsbury would help during the week, not being around a lot of people. Coming back at the weekend, I was involved, getting caught up in trouble - it could happen in the town centre or parties. As much as I was away from it, I was pretty much involved." He spent two years playing for Conference North side Hinckley United, based about 40 miles away from Wolverhampton, before joining then non-league Luton Town in 2012. Gray said that move was "the main" factor in getting out of trouble. "I was moving away from home. I was living away from home at Shrewsbury but it was still too close - a 20 or 30-minute drive. "Moving to Luton was massive. Getting my own place and knowing it was difficult to go home, that helped a lot. "I made mistakes along the way, I'd go to certain places and things might happen. It's not as easy as clicking your fingers and completely stopping what you're doing. "You don't mean to put yourself in those situations but [you go to] certain nightclubs where these things can happen. I've been out minding my own business and a fight happens next to me, nothing to do with me, and a stray bottle hits me in the head. "It's trying to explain to people that it's nothing to do with me. I am stereotyped and people have a certain view of me, but these things can happen anywhere. "It's hard to fully come away from it all. It's a long process - it's not something you can just switch off overnight. You could have trouble with people and you can't just decide: 'I don't want anything to do with it any more.' It took time to take my mind away from that kind of thing. "Even now I'm still learning from things and might make mistakes along the way. It's a hard thing knowing that something is built into you - to sometimes walk away from certain situations. "Before, if I'm in the wrong situation I tended to fight back and react in a way I know I shouldn't. If I feel backed into a corner or threatened, I will defend myself. Obviously it's wrong. "I've learned not to put myself in that kind of situation." Gray left Luton in 2014 to join Championship side Brentford, before two seasons with Burnley - including promotion to the Premier League - and a move to Watford last year for about £18.5m. His past came back to haunt him when he was banned for four games while at Burnley in 2016, after old homophobic tweets were discovered. He apologised at the time of the ban. "That was long behind me," he said. "Even at the time it didn't faze me because I know what kind of person I am now compared to before. "That's not a representation of who I am. People have their opinions even now, but until you meet me you can't pass judgement on something I said years ago. "I'm still the same person I've always been. I'm still always friends with them [the Wolverhampton group]. I haven't changed, I've just grown up and learned a lot." Gray is trying to help with the issue of knife crime in his hometown. "It's pretty bad in Wolverhampton," he said. "It's a difficult subject to touch on. I've been in those situations, so I can't sit here and preach about things. "It's so difficult to put your finger on why it's so bad and why it's got worse over the years. A lot of it is social media and the whole thing of being a gang member and stabbing this person or that person. It's more of a fashion. "But, at the same time, you don't know everyone's situation. People have reasons for doing what they do. "You have to indulge in kids to find out what their reasons are and try to work with them. You can't just expect to tell them it's wrong and for them to stop."